Frequent readers of this blog have probably realised I have a soft spot for ‘real life’ stories: Gladys Aylward, Dr Kotnis, Changez Khan, Shahjahan: I’m game. Of course, I don’t always end up with films that bear any resemblance to the life of the person in question, but there’s no harm in trying. So, another. Afanasy Nikitin was a horse trader from Tver in Russia, who came to India in the late 15th century, having started off from Tver in 1466. His travels took him down the Volga River, through Persia, and then via dhow to India. He is believed to have disembarked in present-day Maharashtra; over the years that followed, he travelled through a large part of peninsular India, including Bidar and Vijaynagar. He died in 1472 in Smolensk, on his way home; his travelogue of India, however, endures: entitled Khozhdenie Za Tri Moray (‘The Journey Beyond Three Seas’), it describes in detail all that Nikitin saw of what was to him a wild, exotic land like nothing he knew. It also became the basis for this 1957 film, the first Indo-Soviet co-production. 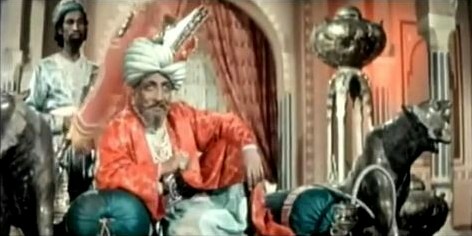 Pardesi or Khozhdenie Za Tri Moray was directed by Vasily Pronin and Ahmed Abbas, and dubbed in both Hindi (a B/W film) and Russian (a colour film). Despite much effort, I wasn’t able to lay my hands for a long time on the Hindi version. But Richard managed to find a subtitled copy of the Russian version on youtube, which I’ve finally got around to watching. Unfortunately for all these ladies, an old friend of Nikitin’s, Mikhailo (Y Belyakov) turns up, and when he gets a chance to chat with Nikitin, persuades him to come along on a trip to Moscow. Mikhailo and some other merchants of Tver will be going to meet the Grand Prince in Moscow; it’ll be a fabulous trip. Nikitin agrees, and the men go off to Moscow and to an audience with the Grand Prince (who looks rather a lot like Rishi Kapoor, doesn’t he? The actor’s L Topchiyev). The Grand Prince has recently met a Lithuanian who travelled to India, and shares his learnings: that the Indians have tails (some have two heads), and are ruled by a Monkey King. Nikitin and Mikhailo, both well-travelled enough to see through this baloney, laugh it off. The result is that the Grand Prince ask them if they’d rather go to India and see for themselves. With them will go other merchants, and part of their mission will be to find possible markets for Russian goods in India—and Indian wares that may sell in Russia. Both friends agree readily. This news bursts as a bombshell in Nikitin’s home, with mother and sisters pleading with him not to go. Realising that her son won’t listen, Varvara finally gives him her blessings, along with more practical gifts: a pearl necklace that he can sell if he should fall on hard times, and a potion that can be used to cure snakebite. So Nikitin & Co. set off, travelling down the Volga. Their boat meets up with that of Hassan Bek (P Jairaj), the Ambassador of Shirvan to Russia. He is surprised at the adventurousness of the Russian merchants, and is especially impressed by Nikitin’s intrepidity in going off to India. Hassan Bek goes his way and the Russians continue—straight into the mouth of disaster after disaster. First, their boat is attacked by bloodthirsty Tatars, who kill some of the Russians, take others prisoner, and either destroy the goods the Russians are carrying, or carry them off as loot. Nikitin and Mikhailo find themselves on their own. They set off on foot, and a while later, a weakened Mikhailo collapses and dies (in dramatic fashion: he crosses himself, falls flat, exclaims “I am dying!” and cops it). Nikitin is now on his own. But he joins a caravan that is passing through, headed for the port of Ormuz in Persia. As they travel, they find another traveller on his own: the Portuguese Miguel Rivera (V Yakut), who was abandoned by his caravan after he fell ill. Miguel joins the caravan too, and becomes friends of a sort with Nikitin. Of a sort, because one night Miguel steals Nikitin’s money, punctures the caravan’s waterskins, and rides away on a stolen horse. Nikitin, with his last bit of money, buys a horse from the caravan and chases Miguel all the way to Ormuz. He catches up only by accident, when the ship he boards for India happens to be the same one on which Miguel has stowed away. One night, Nikitin discovers Miguel and, after a tussle, pitches the thief overboard. With Miguel out of the way and Nikitin’s sole possessions down to his clothes and his horse, we’re now free to concentrate on Nikitin in India. Which, of course, is what this film is mostly about. Nikitin’s ship docks somewhere on the west coast of India, and our man is suitably dazzled by all the sights and sounds. 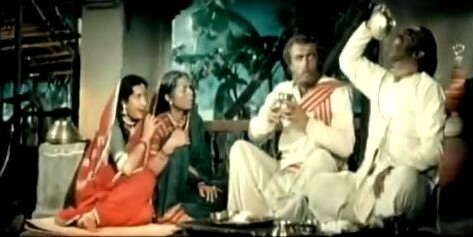 He is impressed by a minstrel, Sakharam (Balraj Sahni), then miffed when Sakharam refuses to accept the money Nikitin holds out. There are others, though, to whom Nikitin proves useful. A distraught elderly couple (Manmohan Krishna and Achla Sachdev) have come to the temple, crying and shrieking because their daughter Champa (Nargis, though we don’t see her face: her long hair covers it) has been bitten by a snake. The temple priest is the only person who can cure her, and he isn’t around. It seems fortuitous that Varvara had given her son a cure for snakebite; Nikitin now uses it to cure Champa (all without seeing her face) and thus earns the undying gratitude of her parents. He goes off; we get a glimpse of the recovering Champa’s face; and the scene shifts to Nikitin, who finds that in his absence, someone has stolen his horse. In his endeavours to find his horse, Nikitin makes friends with Sakharam, who tells Nikitin that he’d refused the foreigner’s money because he wanted to test him: Nikitin’s anger proves that he is an honest man. Nikitin also learns something useful: that his horse has been taken by the local governor, Asad Khan. So Nikitin goes off to meet Asad Khan (David), who turns out to be a wily and dishonest creature. Much pleading (Nikitin) and sarcasm/oiliness/nastiness (Asad Khan) later, Asad Khan offers to return the horse if Nikitin will convert to Islam. When Nikitin, staunch Orthodox Christian that he is, refuses, Asad Khan threatens to have him clapped into prison if he doesn’t produce a guarantor within five days’ time. Nikitin, you see, has lost his deeds of passage somewhere along the way, so is actually an illegal immigrant. Nikitin’s luck suddenly takes a turn for the better shortly after. Guess who arrives in town, runs into Nikitin, embraces him and puts Asad Khan in his place? Hassan Bek, the Ambassador of Shirvan! It’s a small world, and Nikitin gets his horse back. He now sets off for Bidar, but hasn’t gone far when it starts raining. Nikitin takes shelter in a village where he is spotted by none other than the parents of Champa, who also live in the village. They invite Nikitin into their house and, since the rains in this part of the land are incessant—it will rain now for three months without pause, Champa’s mother says cheerfully—they insist that he stay with them. Nikitin now finds himself shut into the same house as the lovely Champa, and both of them soon fall in love. They don’t say a word about it—not even to each other—but it’s fairly obvious, except to her parents. Nikitin begins to see roseate dreams about marrying Champa, but wakes up when he realises that the differences between them, of religion and country and tradition, are too vast and that Champa will probably never consent to marry him. When the rain stops (even though Champa has been praying desperately that it will never stop and that Nikitin will not leave), he does leave, sorrowfully. Champa’s mother mentions that Champa has been betrothed since she was a child and will be getting married soon, which does nothing to make Nikitin feel happier about going away. He rides off, though, to Bidar. There, he sells his horse and makes a little money; and he meets again an old friend, the philosophical Sakharam. So much so, that after his efforts to get an audience with the Sultan of Bidar fall by the wayside, it’s Lakshmi he goes to for help. She tells him that the Sultan is a mere child; the de facto ruler is the Grand Wazir, Mahmud Gavan, an ex-merchant, and a scholar and astronomer to boot. Nikitin goes to the observatory that Mahmud Gavan has built (more on this later), where he meets a wise old man (Prithviraj Kapoor). They chat a bit, Nikitin warms to the old man—and then meets him again later, when the Grand Wazir’s soldiers drag Nikitin off to the Grand Wazir’s hall of audience. The wise old man is Mahmud Gavan. He asks Nikitin if the Russian would like to go to Vijaynagar—a kingdom which happens to be Bidar’s greatest enemy—and when a surprised Nikitin agrees, Mahmud Gavan springs a surprise: Nikitin will go to Vijaynagar as a spy for Mahmud Gavan. What next? Does Nikitin agree? What happens of Champa? Of the beauteous Lakshmi? And how does Nikitin end up back in Russia, at the end of his tether? Padmini. I must confess I’m not much of a Padmini fan, but in this, she’s wonderful. She’s grace, she’s beauty, she’s allure. Her dancing is fabulous, too—watch this fascinating performance where, just by gestures, she says a lot. The beauty of it all. M S Achrekar won a Filmfare Award for Art Direction for this film; and it does have some lovely frames. I’m not sure why (perhaps because of the cast), but I had great expectations from this film. Expectations, unfortunately, which it did not live up to. Some parts of the film are fairly true (they include narration from Nikitin’s travelogue), but on the whole, the film just isn’t very gripping. Nikitin’s reasons for faffing about all across India are a little vague (only occasionally are we reminded that he’s here to explore opportunities for trade), and too much of what happens is a pointless aside that doesn’t really add to the story. Nargis and Padmini’s roles. One of the best actresses in Hindi cinema from the 50’s, and one of the best dancers ever. And what were they doing in this film, with such minuscule roles? Honestly, these two were wasted. Or maybe they were there just because both were so popular in the USSR. The historical monuments used as backdrops. Yes, a lot of people probably wouldn’t recognise the Tomb of Ghiyasuddin Tughlaq, the Jama Masjid, or even the barbican of the Red Fort; but they just might, mightn’t they? And considering that the Jama Masjid and the Red Fort were built in the late 1600’s, and that Tughlaq’s tomb, though already built, was hundreds of miles north, in Delhi, rather than in the Deccan… no, that shouldn’t have been done. Also, remember that observatory where Nikitin meets Mahmud Gavan? Jantar Mantar, built in the 1700’s. Brownface! On Indians? All right, so we’re not as gora as the goras. But to have Achla Sachdev, Manmohan Krishna and Balraj Sahni (the most unfortunate victims) looking as if their faces had been rubbed in chocolate? Arrgh. Ultimately, this is just a rambling, somewhat boring film. 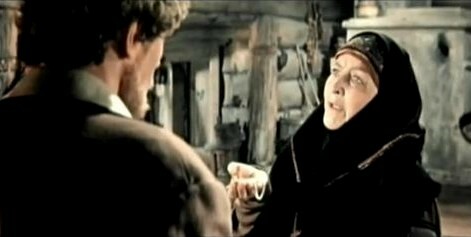 The (too few) scenes between Oleg Strizhenov and Nargis are sweet, though not too great on chemistry. Balraj Sahni is his usual wise, likeable self. The songs, scored by Anil Biswas, are good. But otherwise, the story goes all over the place, without sufficient motive. This should’ve either been more of a romance, or more of an adventure, or more of a drama. It tries to be all, and doesn’t quite succeed. P.S. One thing that did touch a chord in me: the Indo-Soviet socialist bent of part of the film. I grew up at a time when India and the Soviet Union were the best of friends: lots of our children’s books were from the USSR, and every now and then, Delhi would play host to a USSR Festival or something of the sort. USSR almost felt like a second home, even though we’d never been there (we ‘knew’ it so well, my husband still says his favourite fairytale character was Baba Yaga!). Well: Khozhdenie Za Tri Moray reminded me of those days. There was Oleg Strizhenov, praising India and talking about how he felt about all the many wonders he saw in India; and there were Strizhenov and Balraj Sahni, or Strizhenov and Prithviraj Kapoor, talking about how everywhere the rich and powerful oppressed the poor… medieval socialism, and it made me feel somehow nostalgic about my Soviet-influenced childhood. Afanasy Nikitin’s back story does take up quite a bit of time, so if it had been cut out completely, Pardesi would have been perhaps only about an hour long… and in any case, everything – including the roles of Nargis and Balraj Sahni seemed to fit in very well, from Nikitin’s point of view. And Sakharam and Champa have no connection, except that Nikitin knows them both. So yes, I think you focused on them to the exclusion of all else! :-) Not surprising; I did that to a lot of Dev Anand or Shammi Kapoor films that I saw as a kid. I haven’t seen the Hindi version either but like you said, I always found the the star-cast and the theme very alluring. To add to that, Padmini’s fabulous dance. Though the film seems to have lots of flaws, I would still like to watch it. This is a good writeup, and accurate too. And by the way, in addition to Padmini, one thing that really stood out for me in this film was Anil Biswas’ music – it is beautiful too. sunheriyaadein: Worth one watch, at least. How many Hindi films are there in which the heroine (well, two heroines!) fall in love with a foreigner? And it looks beautiful, plus it has good music. Enough reason to watch! Richard: Thank you for digging up that link! I’d been searching for this film for a while, and when I couldn’t find the Hindi version, I’d finally ended up putting the subtitled Russian version on my Amazon wishlist. It’s off it, now – somehow I don’t think it’s good enough to own. Yes, the music is good too; my favourite songs are the ones sung by the women – Rasiya re man basiya re and Na dir deem: lovely, both. You know, your comment about the ‘advocacy of inclusiveness and spiritual pluralism’ got me thinking: it’s so sad that the ‘innate goodness’ that so many old Hindi films preached has gone so largely out of style. Of course, some of what was thought of as ‘good’ – women being submissive and tolerating all, etc – deserved to have been discarded along the way, but a lot of other ‘virtues’ – such as the ones Pardesi dwells upon, or the basic premise of Jaagte Raho – need resurrection. I can’t remember the last time I saw a new Hindi film that had the guts to be old-fashioned in that sense. I felt exactly like you when I started watching the film. It surely could have helped if they had hastened the pace and nothing really gripping about it. Oleg looks very handsome, but that is it to it. Yes, he is handsome, isn’t he? Now I’m searching for other films (subtitled, of course) that he starred in. Have discovered one named The Forty-first which has been highly spoken of on imdb. It won the director a Golden Palm at Cannes. Yes, if for nothing else, it’s worth seeing for the prettiness of it all. Very nice! To me it was like a day to day journal being narrated…he did this…then he did this…now he’s on his way there ..etc etc. I guess I’m so devoted to the 70s/80s adaptations of Jane Austen novels by BBC that I quite enjoy this slow style of day to day life narrations. I liked the scenes at home in Russia, reminding me strongly of our hindi films of 60s and earlier…praising the motherland (Russia), mother wanting the son to marry and settle down, mother running to the alter to complain to God, unmarried sisters, and other such scenes. The subtitles were really good, and gave me the sense of very good dialogues in the original language. Bidar is a smallish town where I spent three years of my life as a schoolgirl. It’s inside the walls of a fort, and though the town has spread outside it you have to enter through huge darwazas set in the wall at intervals, to get into the town centre. One of these (the one we used) had a snake living in the nooks and corners of the darwaza and would hang out airing itself from time to time forcing people to stay away or take another of the darwaazas. I spent a peaceful time filled with pleaasure last night watching this film. Thanks for bringing this to attention, and the link given by Richard. Bidar’s darwazas sound very interesting – and that little detail about the snake gives it even more punch! :-) I do wish they’d taken the trouble of actually filming it in Bidar. I can imagine how striking all that red earth must look! Saw a lot of it in the area around Gwalior, where I spent part of my childhood, and have always thought it looked so pretty! 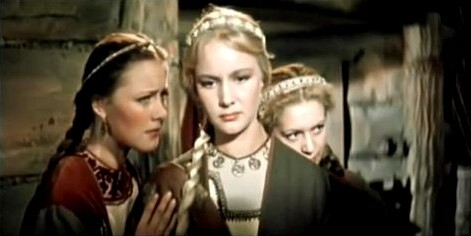 I haven’t watched “Alexander Nevsky” since the 1980’s, so my recollections may not be entirely clear, but I liked it quite a lot. I think there is a good deal of “speech-making”, a very slight romantic element( Alexander’s sweetheart (or someones’) disguises herself as a soldier, and the long climactic battle on ice is both visually bizarre and impressive. I really liked the musical background score by Prokofiev, so much so that I used to have it on audio cassette. kenjn60, thanks so much for that information! The idea of a battle on ice, and a sweetheart who disguises herself as a soldier – not to mention Prokofiev (whose Peter and the Wolf happens to be one of my favourite pieces of classical music). I think I’d better borrow the film after all. I thought Ajooba was the grand pinnacle of Indo-Russian cinema but apparently not. I’ve never even heard of this movie but it sounds amazing – well, no it doesn’t but the concept sounds great! I need to read this book too! I love reading about travels pre-19th century. You simply don’t have that kind of adventure once the world had more of less been “discovered”. I hear you about the Russian-infused fests in Delhi. I still have this giant book of Ukrainian fairy tales that were a gift from Santa one year and Baba Yaga left such a strong impression on me that when I tried to co-write my first YA novel, I insisted she play a significant role in it much to the bemusement of my American friend. I’ve seen both versions of “Pardesi” and the production values/video quality of the Russian version is infinitely better than the Indian. You’re right about the plotless, meandering nature of the film, but I enjoyed it nevertheless…perhaps because it’s at once an insider and outsider view of India. The music, the landscapes are gorgeous and K.A. Abbas and Pronin did a nice job imbuing the film with old-world charm and intrigue. :-) Yes, seeing all of the Indians (Prithivraj Kapoor, David and P Jairaj were the exceptions) looking so artificially tanned was irritating! Now that I think of it, was it a way of showing that the ruling class were Aryans and lighter-skinned than the native Indians from the peninsula? God knows; but it irked me. the indian version of the film was also made in colour. The dance of padmini is slightly different in indian version. ( a different conversion from Russian print). and it was blocked by MOS Film. as the surviving prints in India were only in B&W and were highly worn-out. or their last para was deleted.